American Red Cross Volunteer Special Service Corps, Washable Uniforms for Administration, Staff Assistant, Production, Braille, Canteen, Home Service, Hospital and Recreation and Paid Staff Workers (Except Hospital Workers). Even though commercially produced uniforms seem to have been readily available, the Simplicity company must have thought there was enough of a demand for a pattern to make this one available, as well as number 4694, home nursing pinafore and canteen apron. Here's an example of a commercially produced uniform in the collection of the University of North Carolina. No fabric recommendations are given, presumably because the ARC would have issued their own specific instructions on this. (1) Shirley Powers's web site, http://www.collectarc.com/ was very helpful here. I always enjoy your posts but this one especially and it reminded me to thank you for sharing all your collection and knowledge. I learn something every time and I appreciate the work you put into this. 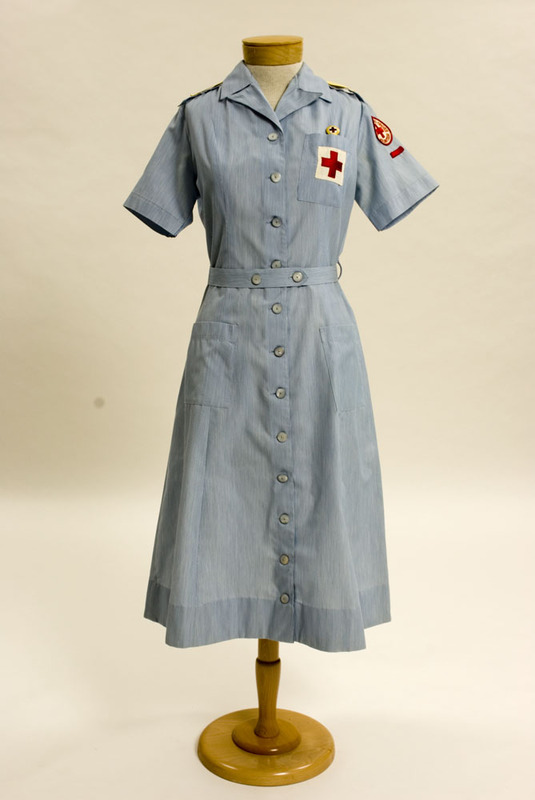 I have a similar ovrall type Red Cross dress made up -it looks to be home sewn, and has RED CROSS CANADA on the emblem. It is double-breasted but very similar. As I have no use for it and rescued it from a rummage sale discard, I would be happy to send it to you or nayone who might want it. I can email photos if desired. It is cobalt blue with matching buttons. Magdalena - I would recommend contacting Shirley Powers through her web site, http://www.collectarc.com/. She should have a good idea where your Canadian Red Cross dress can find a home. Would you happen to have a high-resulation scan of the pattern? Say, 300dpi of the pattern or 1200dpi of the back of the envelope? I've looked everywhere I can think of and cannot find a copy. Max - These Red Cross patterns show up periodically on eBay, but the process of trawling for them every week is terribly boring. 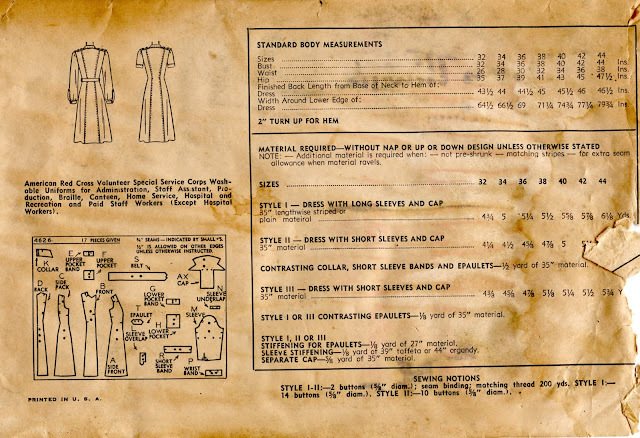 I can provide you with scans at the resolutions you desire of both the front and back of the envelope, but I'm not able to digitize the pattern pieces themselves - will this meet your needs? Feel free to email me to discuss.